As 1995 dawns in the North of Ireland, Belfast is a city of army patrols, bombed-out buildings, and “peace walls” segregating one community from the other. But the IRA has called a ceasefire. So, it’s as good a time as any for Monty Collins and Father Brennan Burke to visit the city: Monty to do a short gig in a law firm, and Brennan to reconnect with family. And it’s a good time for Brennan’s cousin Ronan to lay down arms and campaign for election in a future peacetime government. Anyone looking for a mystery series to read would be well advised to consider the Collins-Burke mystery series by Anne Emery. . . . 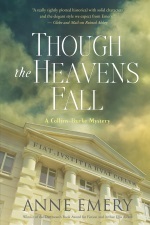 Filled with lots of suspense, a good plot and some history, Though the Heavens Fall is another excellent novel in this entertaining series! Fans won't want to miss this strong installment in a fine series. The two cases intersect with devastating results. Emery doesn't pull any punches when it comes to politics. The dialogue is smart and the story brutally emotional. Emery develops a wide range of characters really well . . . Though the Heavens Fall keeps us on our toes until the bitter end. And based on that ending, the sequel will be a must-read too. ... A dark novel, by far the darkest yet in Emery's 10-book series, guaranteed to leave even the most casual reader deeply disturbed ... Though the Heavens Fall is a fine example of how, in the hands of a skilled and dedicated writer, a novel can enlarge our understanding of complex issues in the real world. Clearly one of the finest reads of 2018.